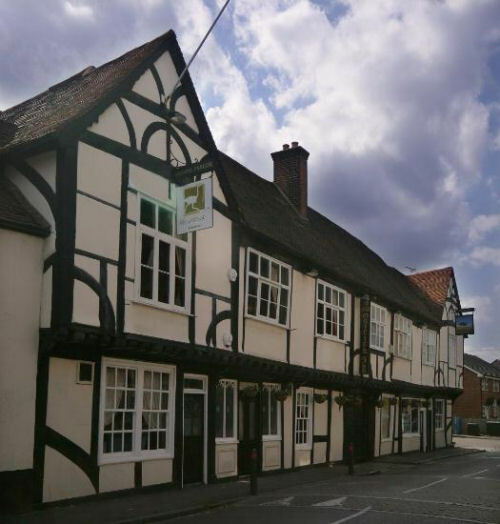 The Ostrich Inn claims to be the the 4th oldest pub in the country with records dating back as far as 1165. The pub was also the first to be featured within a novel, Thomas of Reading, writen in the late 16th century. The building remains to this day as a pub. Records claim that over 60 murders have been committed at the Inn, During the 13th century, the landlord, A Mr Jarman and his wife made a profit by murdering guests of the Inn. They would intoxicate the guests and offer them his best room, once asleep, he would undo 2 bolts in the ceiling from the room below which would cause the bed to tilt to a 45 degree angle, where the guest would then fall into a vat of boiling fat in the room below, the guests belongings and horses were then sold to local gypsies. Some of the most common ghostly experiences include, strange noises, objects moving on their own and ghostly figures. Also a woman in Victorian dress has been seen walking the corridors. The most haunted area of the building is said to be the upstairs restaurant, which is in the room next to were the original murders would of taken place. Another common report is to experience feelings of despair and cold spots in the downstairs ladies toilet. This used to be the pantry, and the spot were Jarman would have stored the bodies of the victims he murdered.